Joyce M. Soule, RN, BSN, MSN, is the new chief nursing officer (CNO) for Saint Joseph's Hospital. 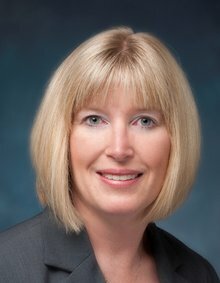 Joyce M. Soule, RN, BSN, MSN, a leader in the field of medical and perioperative nursing for nearly 20 years, has been named chief nursing officer (CNO) for Saint Joseph’s Hospital. Soule comes to Saint Joseph’s Hospital from Medical City Dallas Hospital, a 680-bed adult and pediatric Magnet re-designated hospital. There she served as vice president of surgical services. "Joyce's leadership style encompasses team development, transparency, collegial decision making, renewing culture, strategic planning/execution and shared governance," says Scott Schmidly, CEO of Saint Joseph’s Hospital. "I am confident that she will prove to be an outstanding CNO for our hospital." An Iowa native, Soule also brings leadership experience in both academic and private hospital settings. Her expertise also focuses on the clinical, regulatory and financial elements critical to the success of nursing operations and achieving Magnet designation. In 1995, Saint Joseph’s Hospital was the first hospital in Georgia and only the third hospital in the world to receive Magnet designation for excellence in nursing services. Designated by the American Nursing Credentialing Center, an affiliate of the American Nursing Association, the Magnet Recognition Program is considered the gold standard of nursing care. The hospital has consistently earned Magnet recognition since then. Soule holds a Bachelor of Science in Nursing and a Master of Science in Nursing: Health Care Administration, both from Graceland University in Iowa.